Neither government officials nor committees of experts that they assemble can possibly process as much information as free markets provide through the forces of supply and demand to determine what wages should be. This is one of the fundamental errors of socialism (take note, Bernie and Alexandria) - namely, the presumption that government planners have enough wisdom to overrule markets and set prices. Alas, the woeful result of such hubris is that by supplanting the pricing mechanism that brings supply into balance with demand and thus coordinates economic activity, economic production becomes uncoordinated, irrational, and chaotic, leading to impoverishment (see Venezuela). Advocates of minimum wages might retort that there are normative issues here that take precedence - that it isn’t “just” or “fair” that an employer pay an employee (even one who is eager to work at a low wage) less than their arbitrarily chosen minimum. Those who clamor for higher minimum wages are completely free to pay higher wages to anybody they choose to employ. But what gives them the right to tell somebody else how much they must pay for something? Let’s say that an enthusiastic supporter of higher minimum wage laws has fallen in love with Tesla automobiles and wants to buy one. Now let’s pretend that Tesla is on the brink of bankruptcy, and that if it goes out of business, a number of Americans will lose their jobs and means of self-support. Using the logic of the minimum wage law, government should intervene to raise the price of Teslas to improve Tesla’s profitability and preserve those jobs. This is Economics 101: higher prices tend to reduce demand. 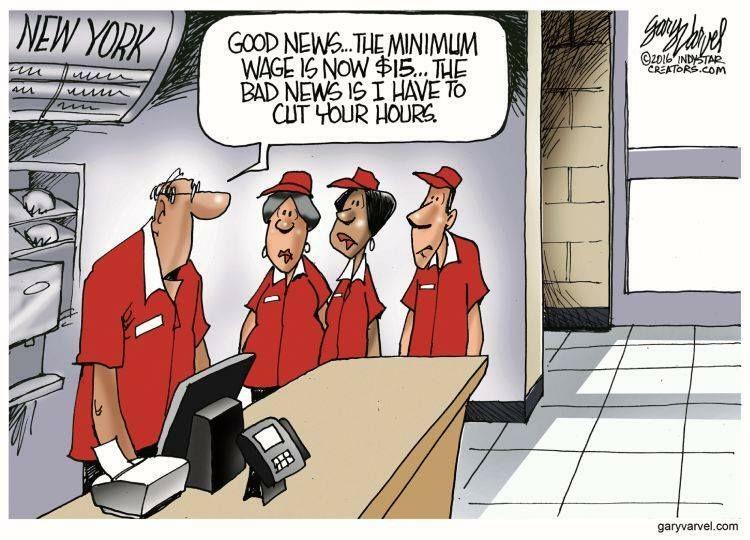 That is exactly what happens with minimum wage laws. Yes, the income of some minimum wage workers (emphasis on “some”) goes up; for others, though, it goes down, sometimes all the way to zero, as employers compensate by reducing hours of some workers and laying off others. This isn’t just economic theory. In New York City, where the legally mandated minimum wage rose more than 15% on January 1, a New York City Hospitality Alliance survey found that 75% of restaurants intended to reduce employee hours and 53% responded that they would eliminate some jobs. 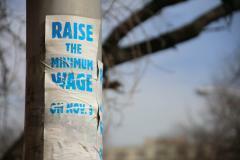 A higher minimum wage is the last thing those adversely affected workers needed. Wolf is proposing to reduce the income of some workers and push others into the unemployment line so that others may benefit. What is so fair or just about that? And where this insidious process really gets ugly is that raising the legal minimum wage hurts black Americans a lot more than white ones. This disparate impact is a gross injustice that mocks our civil rights laws and indeed the Constitution itself. I am all in favor of higher wages. However, ill-conceived, counterproductive, and ultimately unfair government intervention like Wolf’s proposal is not the way to accomplish that desirable goal. The economic way—the only way to achieve sustainable increases in earnings and standards of living—is to allow markets to work. Purchasing power increases as two market forces come into play: higher productivity of labor and increased demand for labor, both of which are driven by market competition.